Home Media Hub Articles News Groundforce named Plant Hire Company of the Year! Groundforce named Plant Hire Company of the Year! Groundforce celebrates after winning prestigious industry award in Ireland. Specialist equipment supplier Groundforce was among the big winners at the recent annual Plant & Civil Engineer Awards in Northern Ireland. 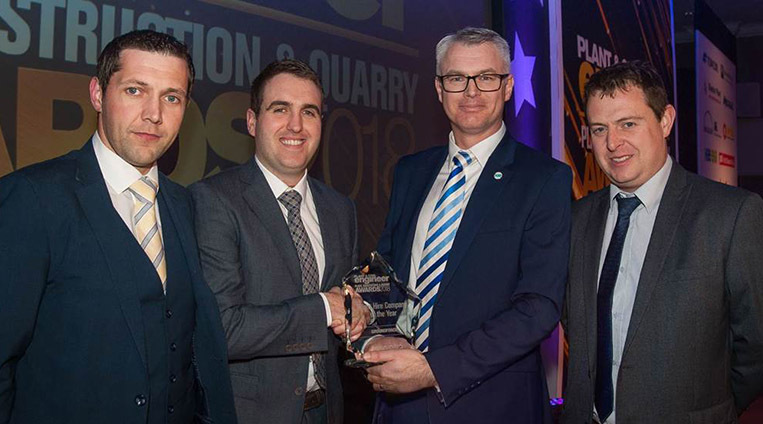 Groundforce was presented with the prestigious Plant Hire Company of the Year award, sponsored by Hire Association Europe and Event Hire Association (HAE EHA), during a glittering ceremony compered by TV and radio sports presenter Adrian Logan at the Crowne Plaza Hotel in South Belfast. Organised by Plant & Civil Engineer, 4SM (NI) Ltd, the event was attended by hundreds of guests and leading figures from the plant, construction and quarry industries. With 14 separate categories, it is widely regarded as Ireland’s premier platform of recognition for those operating across all sectors of the industry. Groundforce Ireland has been operating for more than 11 years and during that time has seen profitable and sustained business growth. The company has two sites - in Portlaoise, Co. Laois and Lisburn, Co. Down. The Lisburn depot was opened six years ago to facilitate a growing customer base in Northern Ireland and this has delivered an impressive rise in revenue. “It has been a fantastic year for Groundforce and it pleasing that our efforts have been recognised by the civil engineering industry” comments Joseph Lenihan, general manager for Groundforce Ireland. “Our employees are at the heart of the business and it is their attention to detail and focus on customer service that has set us apart from the competition”. Groundforce’s commitment to introducing new products and solutions that make a significant impact is one of the reasons why they are market leaders in the ground engineering sector. Their products are helping to raise industry standards together with improving Health and Safety on construction sites across Ireland, the UK and mainland Europe.